This information about changes to the W-2 forms was e-mailed Jan. 20 to all faculty and staff. 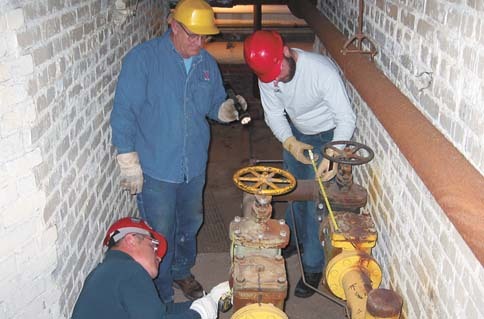 Glenn Bear, center, and Charlie Griesen, right, of Utility Services help measure the valve of a steam pipe that runs under the campus for an insulation jacket. Facilities Management and Planning will add insulation to the pipes to reduce loss of steam and heat, which wastes energy and can be a safety hazard. The insulation is expected to save the university $135,000 a year in energy costs. At bottom is the contractor�s field engineer, Eugene Zlatov. Photo courtesy of Facilities Management and Planning. Standing over one of the steam tunnel vents found on the grounds of the UNL campus may give you a warm, cozy feeling this time of year. But UNL Facilities Management and Planning is busy reducing this heat waste from steam pipes under campus. The Music Man, the story of Harold Hill and the town of River City, Iowa, will be at the Lied Center Feb. 6 and 7. Ana Lisa Hedstrom has been an innovator in surface design for more than 25 years working with contemporary applications of the Japanese technique called arashi shibori, a resist dyeing process. She will give a lecture entitled Rewrapping Shibori at 2 p.m. Feb. 8 in room 11 of the Home Economics Building. Art Textiles - Two Perspectives: Judith James - Michael James marks the first time that the couple, both artists and both in the Department of Textiles, Clothing and Design at UNL, has exhibited together. The work is on display through Feb. 26 at University Place Arts Center, 2601 N. 48th St. The Baltimore Consort will perform at 8 p.m. Feb. 13 at the Sheldon Memorial Art Gallery Auditorium as a Lincoln Friends of Chamber Music event. The concert, titled Cupids Cabinet, will feature English, Scottish, Appalachian and French music. The five instrumentalists and one vocalist are experts in Renaissance and Baroque music and have many individual recordings to their credit in addition to releases by the full Consort. Jay Rich, indigo dyer and fiber artist, will demonstrate indigo dyeing at 1 p.m. Jan. 31 in the Lentz Center for Asian Culture, in the lower level of the Hewit Place building at 1155 Q St.
Nebraska Connects: Are You Man Enough? is a live, hourlong call-in show airing at 7 p.m. today on the Nebraska ETV Network. The program will explore the attitudes and influences that contribute to abusive behavior and violence in the relationships between young people and what can be done to change them.